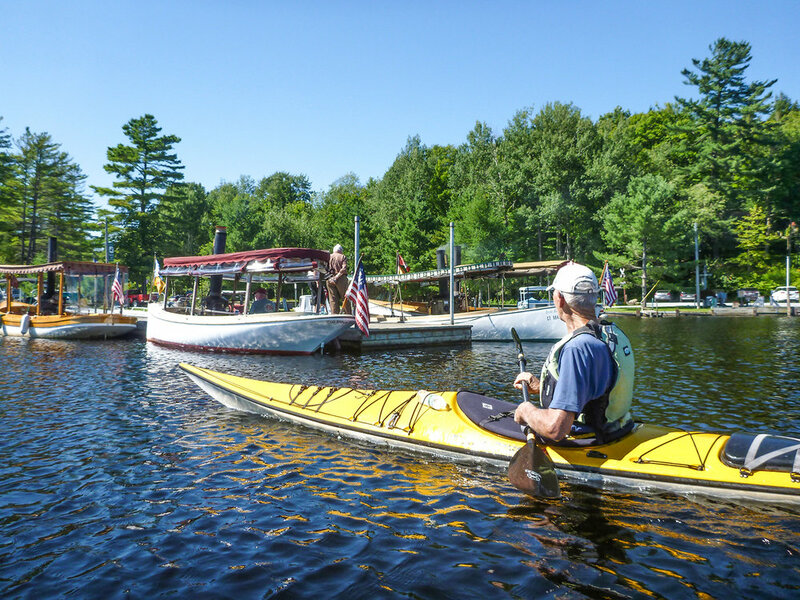 For a paddler, the Adirondack Park is a giant candy store – sometimes you don’t know what to try first. If you are deciding what to try next, one area I recommend highly is the central/western region between Blue Mountain Lake, Inlet and Old Forge. This area includes the Fulton Chain of Lakes, Raquette Lake and the Eckford Chain, plus numerous small lakes, ponds and slow wandering streams. This summer and last, we took two trips to the area, concentrating on Raquette Lake and Seventh Lake. We car camped at New York State Campgrounds located right on each lake and took day-paddle trips. Raquette Lake is one of the largest in the park, with 99 miles of shore line – the total boosted by its many arms, bays and islands. 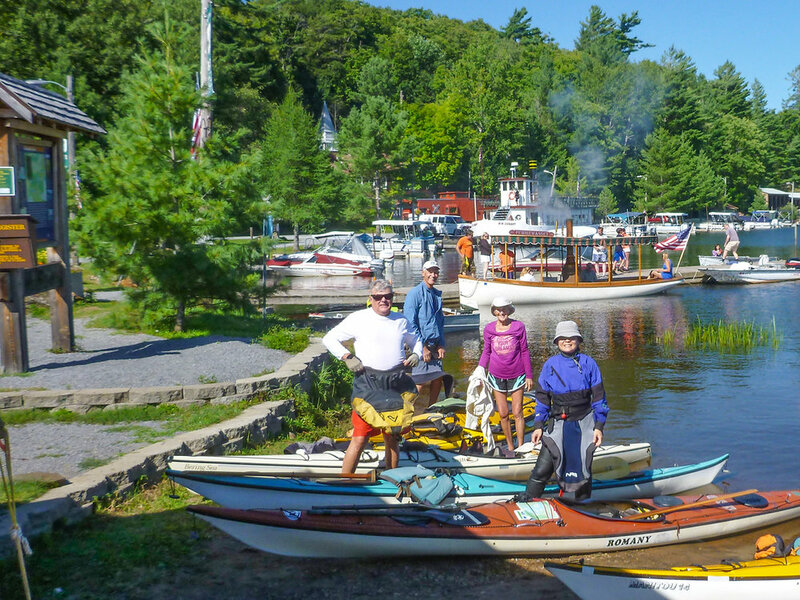 You could spend a week or more exploring every creek, bay and shoreline on Raquette – we had three days to sample its treasures. Setting up camp at Golden Beach State Campground, our group of 12 came from far-flung areas of New York, New Jersey and Virginia. Most of us knew each other through involvement with either the Adirondack Mountain Club or the Atlantic Kayak Tours company. Three people were new to the group – a new girlfriend, a new boyfriend, and the third just a paddling friend. Golden Beach seems to be one of the older state campgrounds, with many of the sites a bit small and some not so level. The location, though, is right on the lake, with a broad sandy beach for launching kayaks and canoes. As a large lake, Raquette can be challenging, with frequent afternoon winds out of the west or south west. We were paddling kayaks that ranged from 14 to 18 feet long, and most of us were experienced with wind and waves. Our first day’s paddle was to South Inlet, accessed just across South Bay from the campground. The Inlet is a beautiful stream, with slow current and a wide, twisting form. The shores are mostly bog – a floating mat of sphagnum moss with other bog-adapted plants growing on the mat. I love this community of plants that include insect-eating pitcher plants and sundews. Black spruce and tamarack trees with their wispy branches form a mood-setting backdrop to the bog mat; towering white pines line the edge of the sky. Our first challenge cropped up right away. The day was breezy, with the west wind sweeping across the open lake, starting soon after dawn. As we launched from the sandy beach where our kayaks were staged, we learned that the new girlfriend was paddling a kayak for the very first time! She was a trooper and did well, except for the waves and wind on the initial crossing of the bay. The fellow who brought her wound up rafting up their two boats and I towed them across the bay. As a kayak guide, I always have the tow line handy. Once in the shelter of the inlet, we were fine. The inlet runs for about two miles before coming to a beautiful small falls. The broad rocks at the falls made a great lunch stop and turn-around spot. We agreed to split the group as we came back out of the inlet, some returning to camp, and the rest of us paddling to the western shore of the lake and hamlet of Raquette Lake. Ice cream was our objective, but a stop at this tiny village also offers a taste of history. The railroad from Utica used to end here, providing access for wealthy and not so wealthy camp owners on the lake. Many of the camps still have no road access – boat and snowmobile only. Several small steam boats were docked at the village, and we later saw others on the water – a group of steam enthusiasts meet on the lake for a week each summer. Days two and three involved explorations of other parts of the southern half of the lake. 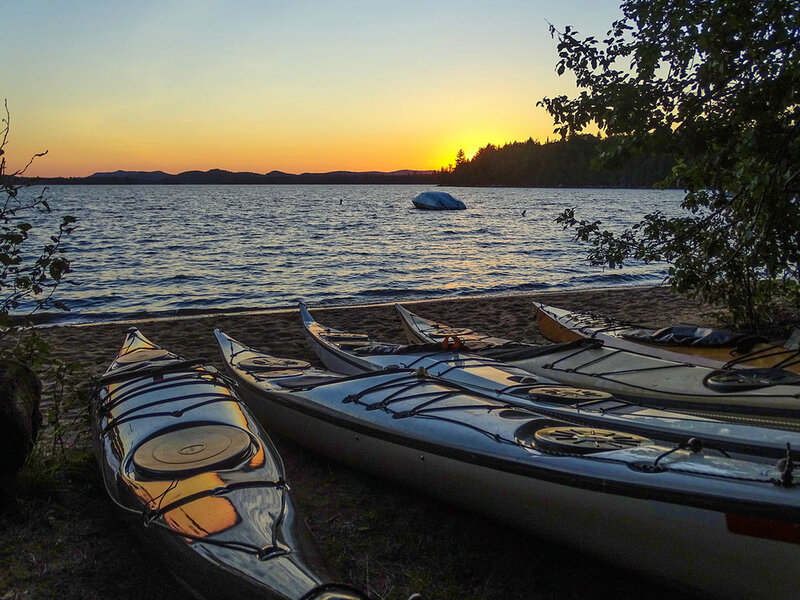 We paddled past many beautiful historic camps, including one considered the original Adirondack “Great Camp,” Camp Pine Knot that was built by William West Durant in the late 1800s. Railroad magnate Collis P. Huntington later owned the camp, and his family gave it to SUNY Cortland. It is used for many of the college outdoor recreation and biology classes. Our visits to the historic St. Williams Church and to Beaver Brook were spectacular. Our last night on the lake was a dinner cruise on the vessel W.W. Durant. Sailing out of the hamlet of Raquette Lake, this tour is not to be missed. They do general tours of the lake, lunch cruises, and dinner cruises (great food). Any of these trips will give you a great peek at the history of the lake, its people and places. This year, we met friends Carol and Pete at the Eighth Lake State Campground for two days of paddling. Pete is fairly new to kayaking, and had along his new (to him) Romany kayak, which I found for him this spring. Carol’s Romany has been with her for many years – these are 16’ British-made fiberglass boats from Sea Kayaking UK. Char had her wooden Pygmy Arctic Tern 14’ that I built over 10 years ago and I brought my old Dagger Meridian. Eighth Lake has bigger, more level sites than Golden Beach, and it spans the land between Seventh and Eighth lakes. There are launching sites on both lakes from right inside the campground. We chose the Seventh Lake end of the facility and our campsites within walking distance of the launch. Our first day’s paddle got off to a leisurely (late) start, and we found the perfect spot for lunch after only a bit more than one mile. A sandy spit on an island in the lake offered a nice landing and a picnic table, so we decided on an early stop. Afterward, we had a nice time exploring the shoreline in a clockwise direction. The western end of the lake has a number of nice camps and a sea plane base. We had almost no motor boat traffic, but kept an eye out for landing and takeoff runs from the float planes. The north shore of the three-mile-long lake has two state lean-to camping sites. We stopped at one for a stretch break – the other one had canoe campers in residence. As we progressed back to the eastern end and near the campground, I paddled near shore and looked down into the tannin-filled brown waters, looking for an old memory. My one other experience with Seventh Lake was in the 1980s, a canoe outing with my wife and my parents. I have a picture in my head of big sunken logs, crisscrossed like match sticks in the shallow waters. Judging from the huge old stumps in the water along the shores, the water level must have been raised in the distant past, flooding the timber along the shores. I found a spot with logs underwater, not quite matching my old memory, but mental pictures tend to grow over the years, eh? In any case, the stumps and upturned roots along the shores made wonderful log sculptures and great photographic subjects. I got so involved with the camera that I got turned around in my directions. Carol pointed out that we were approaching our sandy beach lunch spot, going the wrong way! My wrong turn added about a half-mile to the trip, and we came out at about 7.5 miles for the day. Seven miles can be a long or a short paddle, depending on your physical condition. Two people in our group were still recovering from some serious medical issues, and for them it was on the long side. Day two, we decided to go back on Seventh for a shorter paddle, exploring the very eastern end that we missed the day before. Though it was a short four-mile paddle, we found lots to photograph. Several floating logs had virtual gardens growing on them – bog plants like we saw along the inlet to Raquette Lake, but in a miniature community. At the east end of the lake, a small creek leads to Eighth Lake, flowing under a foot bridge on the trail to Bug Lake. 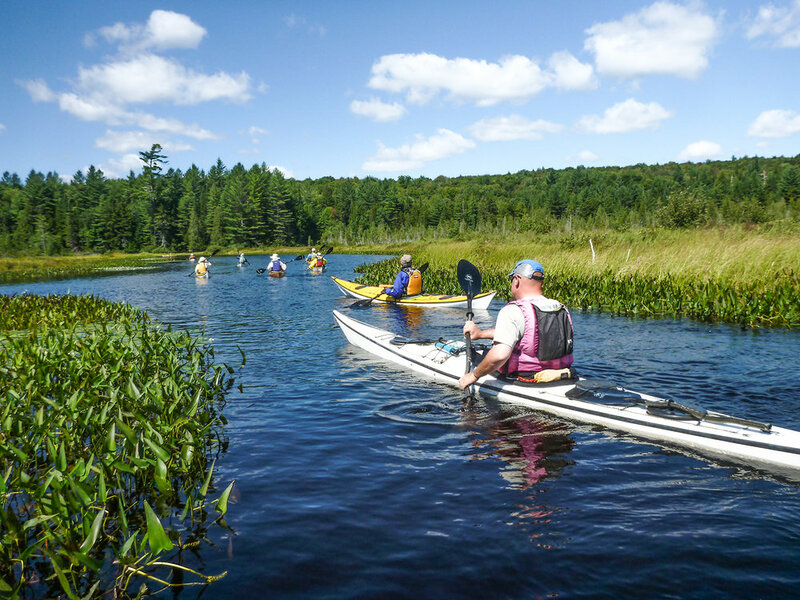 The waters of Raquette and Seventh lakes are only part of the Adirondacks’ rich paddling story, but they have a lot going for them. The state campgrounds on each of these lakes make perfect places to base your future explorations. We hope to return next year and spend some time on Eighth Lake.